Πληροφορίες για το προϊόν: "Η Νίκη και οι άλλοι, Νένη Κολέθρα / Ι Niki ke i alli / Neni Kolethra"
Niki, a Greek young girl, who lives in Sweden, arrives in Greece for her summer holidays. As soon as she touches ground, things start to happen. Her suitcase is lost at the airport. 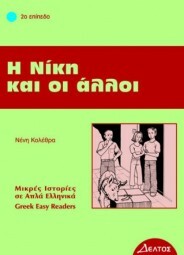 She then meets a young man called Nikos and they become friends. Soon she realizes she is being followed but why? What is inspector Koutras really after? What are the two strangers who raid her apartment looking for? Σχετικά Links από "Η Νίκη και οι άλλοι, Νένη Κολέθρα / Ι Niki ke i alli / Neni Kolethra"
Σχόλια επισκεπτών για: "Η Νίκη και οι άλλοι, Νένη Κολέθρα / Ι Niki ke i alli / Neni Kolethra"